BETHESDA, Md., Dec. 21, 2016 – ROSS Management Services, a leader in multifamily property management in the Mid-Atlantic region, today announced that it won eight awards from the Property Management Association (PMA). 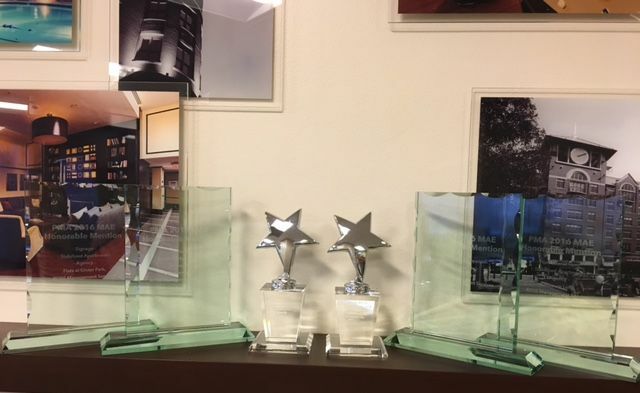 The association, which represents property management professionals in the Washington, D.C., metropolitan area, distributed its Marketing and Advertising Excellence (MAE) Awards and Leasing Professional Awards during its annual ceremony in December. Catherine Quintanilla of Seven Springs Apartments in College Park, Md., came in third in the Prince George’s County, Md., division. Debra White of the Glen Oaks apartment community in Greenbelt, Md., received a Leasing Professional Award – Rising Star certificate, which honors leasing professionals who scored 90 percent or higher on their shopping reports. ROSS’ annual employee recognition event materials, which incorporated the “ROSS Superheroes – Bring on the Good” theme, won first place in the Internal Public Relations category. A new blade sign at Coliseum Lofts, which increased awareness of the community on a busy street, won first place in the Property Signage by an Agency category. The “Coming Soon” sign at Coliseum Lofts in Richmond, Va., which generated excitement for upcoming amenities, received honorable mention in the Property Signage/In-House category. The new signage package at Flats at Ginter Park in Richmond, Va., received honorable mention in the Property Signage by an Agency category. Coliseum Lofts’ promotional giveaway, which consisted of branded t-shirts and water bags, received honorable mention in the Promotional Item by an Agency category. The Live Laurel regional marketing campaign, which promoted ROSS Management’s communities in Laurel, Md., was recognized with an honorable mention in the Portfolio Marketing Campaign/In-House category.